For individual candidates, and to some extent even for parties, another key question of the campaign is who is winning the race for exposure—or what political professionals sometimes call “free media.” It is free, in the sense that advertising exposure must be paid for, while press coverage is not. Which candidates and which parties are winning the derby for press exposure? In the first five months of the campaign, the media found Democrats more newsworthy than Republicans. From January through May 2007, nearly half of 2008 election stories, 49%, focused on Democratic candidates, while less than a third, 31%, focused on Republicans. More than half of this difference can be accounted for by the fact that Democrats started announcing their campaigns a month earlier than Republicans. It is worth noting, however, that the gap existed in other months as well, and also was reflected in all the media platforms studied, including some, such as talk radio and Fox News, that argue they are counterbalancing liberal bias in the media. In three of different news sectors—morning network shows, evening network news, and talk radio—the radio of Democratic to Republican was nearly 2 to 1. That statistic alone does not fully describe the press’ focus. Of the 18 candidates running, even in the early months of the race, the media were concerned with only a handful of contenders. Five candidates—two Democrats and three Republicans—were the focus of more than half of the coverage (52%). These included New York Senator Hillary Clinton and Illinois Senator Barack Obama among the Democrats and former New York Mayor Rudy Giuliani, Arizona Senator John McCain, and former Massachusetts governor Mitt Romney in the Republican field. While Hillary Clinton led in the derby for press exposure (she was the primary subject in 17% of all campaign stories), the largely antagonistic attention of conservative talk radio accounted for most of that edge. Clinton was the focus of nearly a third of all the campaign segments among the conservative talkers studied (the three most popular conservative radio voices, Rush Limbaugh, Sean Hannity, and Michael Savage). Clinton is not nearly as a popular subject among liberal radio talk show hosts. 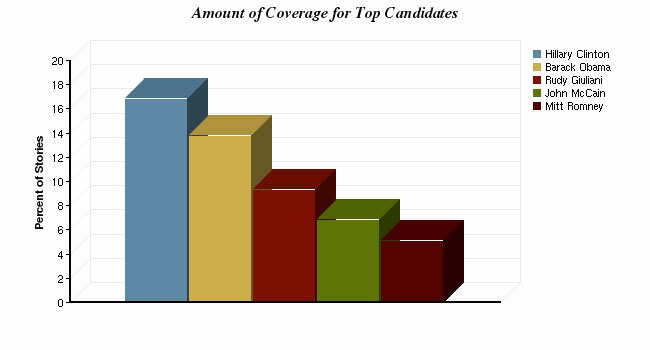 The second-most covered candidate, Democratic rival Barack Obama (14% of stories), got a boost in that coverage from being the No. 1 focus of all the candidates from network evening news. Two Republicans were next in media exposure. Giuliani led among Republicans with 9% of the stories, followed by McCain at 7% and Romney at 5%. They were followed by former Senators John Edwards (4%) and Fred Thompson (3%), whose level of coverage relative to their party rivals probably puts them in what is best considered a second tier. Interestingly, Thompson, the lobbyist, actor and former Tennessee Senator, enjoyed this level of coverage (and name recognition in polling) even though he did not actually enter the race until September. The rest of the candidates would have to be considered not second-tier but third, at least in media attention. None received more than 2% of the coverage. Put another way, of the more than 1,700 campaign stories examined from January to May, Tom Tancredo, Sam Brownback, Ron Paul and Mike Huckabee each were the focus of fewer than a dozen stories. The second tier Democrats fared only slightly better. There were five stories about Chris Dodd, 28 about Bill Richardson, one about Dennis Kucinich, and 41 about Joe Biden. For most, their coverage peaked the day of their announcement and went downhill from there. How dominant were Clinton and Obama as newsmakers? Together, these two candidates commanded essentially the same amount of coverage as all the of the GOP hopefuls combined. And there is some evidence the level coverage does have an impact on public awareness.A Pew Research Center survey from September finds that Clinton and Obama are far better recognized than their Republican counterparts. Fully 78% of Americans could name Hillary Clinton as a candidate, and 62% could name Obama. On the GOP side, 45% could name Giuliani as a candidate, while 30% could name Romney, 27% Thompson and 24% John McCain. Exposure in the press, in other words, may be vital to name recognition, which in turn influences polling and fundraising. During our study time, the total number of candidates was 19. Four have since dropped out: Tom Vilsack left in February and was included in the study. James Gilmore, Tommy Thompson and more recently Sam Brownback dropped out after the span of our study, and Fred Thompson formally joined the race. The same ranking of candidates, incidentally, holds true if instead of number of stories, we look at the percent of all time or words devoted to each candidate.Eighteen percent of the total news coverage of the campaign was devoted to Clinton, 14% to Obama, 10% to Giuliani and 7% to McCain.